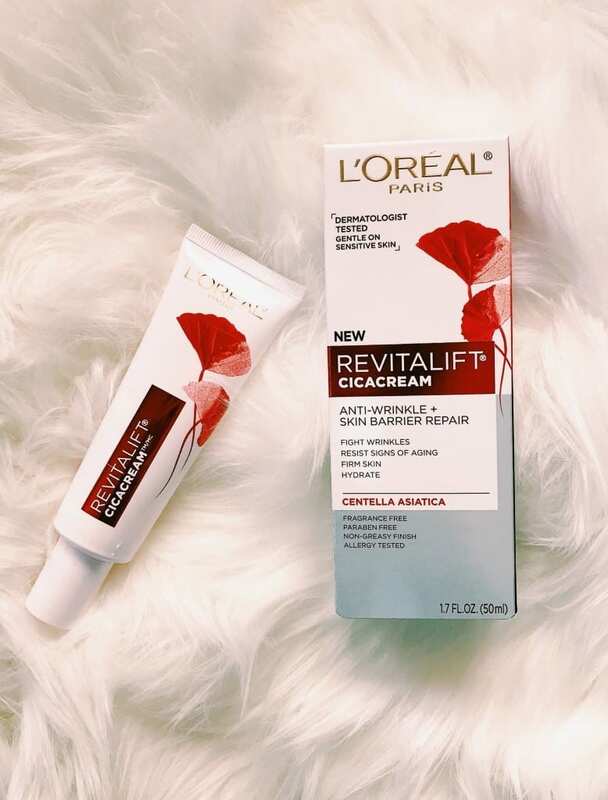 Inside: Are you looking for a L’Oreal Revitalift Cicacream Review? Keep reading to find out more about this new and unique product and its benefits for your skin. This is a sponsored post written by me on behalf of L’Oreal. All opinions are 100% mine. Thank you so much to everyone who filled out the Mom Fabulous reader survey! It was extremely helpful as I plan my content for 2018. Your feedback was phenomenal, as well as really sweet. Other than fashion help, one thing that was mentioned in the survey quite a bit as a major frustration was being able to find products that fight wrinkles and help resist signs of aging. You want products that truly deliver results! As I was reading through your comments I caught myself shaking my head yes, because oh how I can relate! Comments like ‘I feel like my skin aged overnight’ and ‘I’m not asking for perfection, just some improvement’ and ‘I want to like what I see when I look in the mirror’ really resonated with me. 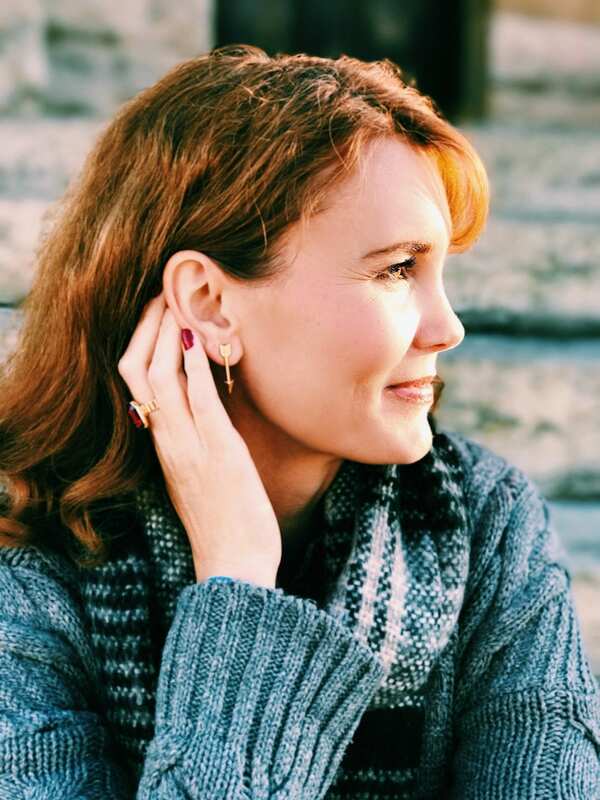 One thing I’ve also wondered is, what can I incorporate into my beauty routine that will prevent those frustrating signs of aging in the first place? Not only is your skin a frustration, but knowing which products are actually worth your money is extremely important to you too. I’ve definitely purchased products in the past where the price was a little outside of my comfort zone and then after using it for a while, I realized it did nothing. Talk about irritating, right? As a blogger, I test a lot of beauty products – many of which don’t receive a mention because they did nothing for me or even irritated my skin. 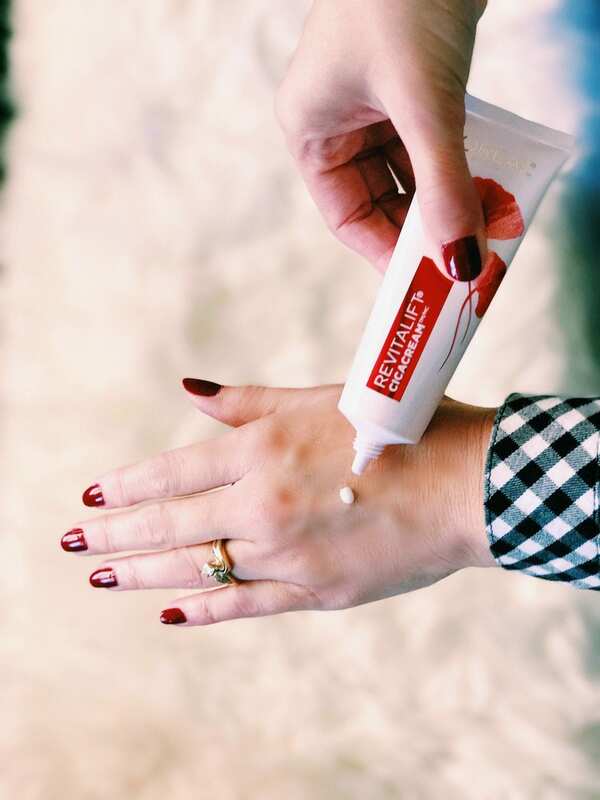 So when a product does cross my desk that works and I fall in love with, I get very excited to tell you about it! Which leads me to today’s featured product. I recently received a tube of L’Oreal Revitalift Cicacream to test out. I’ve used Revitalift products in the past and knew they worked, so when I heard about this new product to the line, I couldn’t wait to try it. You’re probably wondering what Cicacream is. I had never heard of it, so I was very curious of its benefits and history. The name Cicacream comes from Centella Asiatica, a legendary herb from ancient Chinese medicine. Another name for Centella Asiatica is Tiger Grass. Legend says that tigers used to roll around in this herb to recover from their battles. When formulated for the face, it’s known to strengthen and repair the skin barrier. Not only is this product formulated with Centella Asiatica, but also pro-retinol, a powerful wrinkle fighting ingredient. I’ve been singing the praises and telling women for years they need to add a product with retinol to their beauty routine. When I did, it made such a huge difference in the tone and texture of my skin. With these two ingredients together, you have one very powerful formula that not only visibly reduces wrinkles but also helps skin resist future signs of aging. Many of you have expressed that you’re having a hard time finding anti-aging products that are fragrance and paraben-free. I’m happy to say this cream is both! Not only that, but it’s also colorant/dye free, does not contain any skin stripping alcohols and is allergy tested. It’s also non-greasy, which is important for you ladies that struggle with oily skin. The first thing I noticed about this cream was how lightweight it was. I’ve been on the hunt for a cream with retinol that was lightweight enough to wear under my moisturizer. 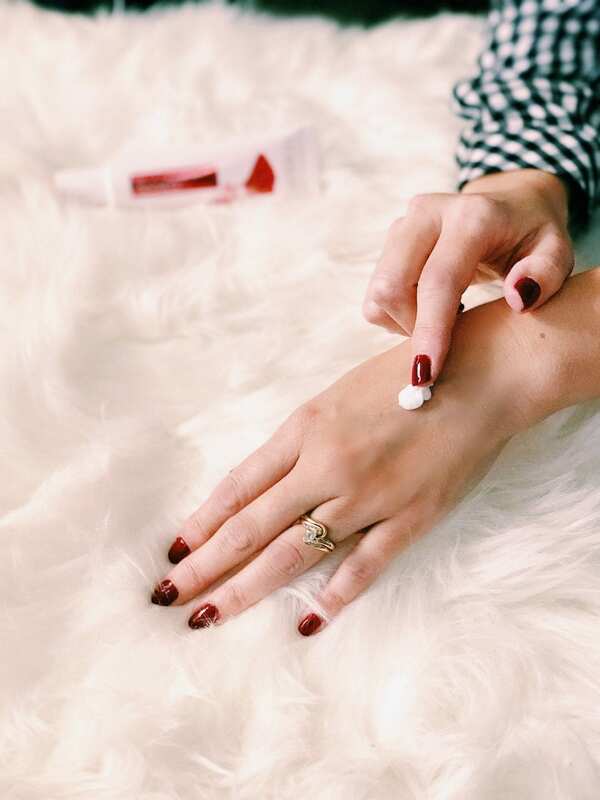 L’Oreal’s Revitalift Cicacream is the perfect addition to my beauty routine. At night, apply it after cleansing and before your eye and night cream. In the morning, apply it after cleansing and before your eye and day cream. It’s a quick, simple step to add twice a day, with noticeable results. You can purchase this L’Oreal product at Walmart. 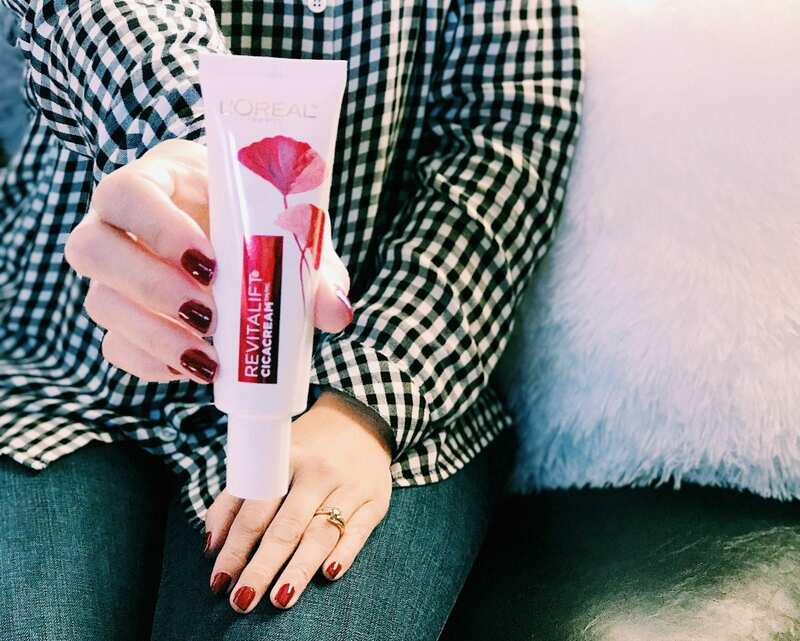 How would you like the chance to win your own tube of L’Oreal Revitalift Cicacream to try for yourself? Five lucky Mom Fabulous readers will each win one (1) tube! Just enter via the form below for a chance to win. DIY All-Natural Face Mask: Moisturizes and Reduces Pores! My biggest concern is under eye puffiness and wrinkling. I call them laugh lines to make myself feel better. Thanks for the chance to win! I am getting more fine lines around my eyes and I also have a few age spots on my face. My biggest skin concern is skin tone/texture. I just recently found the L’Oreal Revitalift line, and like everything I’ve tried! I’ll definitely add this to my list! Thanks for the review! My biggest skin issue is my sensitive skin. My biggest concern is fine lines — I’m getting them near my lips and eyes. My biggest concern is fine lines! My biggest concern about my skin is age…wrinkly and dry! This winter has brought flakiness to the table, I’ve never had that issue before. Too much wind! My biggest skin care issue is fine lines! Signs of aging is my biggest issue. Nail color polish name please. I agree it’s hard to keep up skin’s hard to keep up in the winter. My biggest skin problem is dryness. It doesn’t help that I live in the desert. 🙁 Thank you. My biggest concern is crepiness (is that even a word?) under my eyes! ?_? Oh, Lordy! Dry skin is my biggest issue. Mine is dryness and aging. My biggest skin issue/concern would have to be cold weather cracking and dryness of my hands. Too many years of outdoor work has now resulted in wrinkles and a few spots on my face. Want to hold the line and not acquire anymore. My biggest skin concerns are fine lines/wrinkles around my eyes and mouth and dryness. Biggest skin issue is combination skin. My concern is dry skin! My biggest problem these days is dryness. I keep trying different products but haven’t found the right one for me yet. Dull skin due to sporadic weather changes has been my biggest skin care issue lately. My issue is fine lines and dryness. My biggest issue is dry skin especially this time of year. As I reach my mid-30’s, my skin has transitioned from oily to the dreaded combination. A lot of creams leave an oily residue but I’m happy to see that this isn’t. I also have sensitive skin that doesn’t accept new products very well. Would love to see the results personally for my own skin! My biggest skin concern is definately fine lines and blotchiness. Fine lines especially around my eyes. For me, it’d have to be dry skin from harsh winters and fine lines. Wrinkes and lines around the eyes and on forehead. I have very dry skin, which leads to other problems. My biggest skin concern is dryness. My biggest concern is dark spots. My major issue is excess skin after four children. I’m noticing that as I get older my skin is getting thinner. my bigest concern is small wrinkles that are starting to appear. My biggest skin concern is ageing! Speckles and fine line are my biggest concerns. my biggest concern is dryness!! It would be my loss of firmness and some fine lines. Fine lines and skin texture have been my biggest issues. My biggest concerns are wrinkles and dryness. Dull skin and loss of elasticity. Mine is aging around the neck area. My biggest concern is dry skin. Mine is sagging skin, I hate getting old! Dry red skin mostly..I have a lot of dry skin issues. I hate my horrible dark circles under my eyes. My biggest skin concern is the hyperpigmentation that’s coming to the surface after uninformed sun-tanning in my youth. Until recently I would have said dry skin, but now I’m more concerned with wrinkles!! My biggest issue is dark spots and pesky blackheads. I don’t know if this product would help with those issues, but I’d still love to try it as I use an eye cream and moisturize every night. My concern is the wrinkles and the sagging. My biggest skin problem is oiliness. It is hard to keep under control. combination skin,dry patches and fine lines. My biggest issues are breakouts and a general haggardness. my biggest skin care issue is brown spots. i have to really try hard to keep them from coming. My biggest issue right now are the little lines around my eyes! Circles under my eyes are my biggest issue. I have crows feet and fine lines now. My biggest skin care concern is dry skin. My biggest concern is fine lines. My biggest concerns are wrinkles and hyperpigmentation. My biggest issue these days is dry skin. Deep lines are starting to form in my neck/throat area. My biggest skin issue in the winter months are finding products that help my fine lines, moisturize and help me look less dull! My biggest skin concern is the dryness and the wrinkles! My biggest concern is age spots. I am seeing wrinkles!!! I’m not ready lol. My biggest skin concern is age spots and uneven coloring. I would say fine lines. I think that it is fine lines. My biggest skin concern is wrinkles and uneven skin tone. My biggest concern is the find lines I keep finding everyday around my eyes. Uneven tone- getting worse day by day! Mine is acne and dryness! My skin gets quite dry in the Winters here in WNY. Bleah! Thanks and God Bless! I am getting a lot of fine lines. My skin is dry and getting wrinkled. My biggest concern are my enlarged pores and dryness. This time of year my skin gets so dry…and I can see some of the starting lines and wrinkles on my face. My biggest concern is fine lines and wrinkles. This sounds just like it was made for me. I just turned 53 and have been in search of a great product to help with my aging skin. Up to this point I have yet to find a product that is fit for me and reasonably priced. Wrinkles, undereye bags and sagging skin. Fine lines and signs of aging are my biggest concern. This sounds nice! My biggest concern is my dry sensitive skin. My skin hates the winter time with a passion. Wrinkles and sagging is my biggest concern. I just turned 50! Fantastic prize! Thanks so much for the opportunity! I would love to try this! One of my biggest skin concerns is fine lines and wrinkles and uneven skin tone. Mostly aging skin. During menopause my skin has developed spots and appears dull. My biggest skin concerns are dark spots and lines. Uneven skin tone and scars. My biggest skin concern is that fine lines are starting to appear around my eyes. Dark circles under my eyes is my biggest concern. My biggest skin concern is dryness and sun damage. My biggest skin issue are dark age spots. my skin is really sensitive anything that touches it can make it break out! My biggest concern is the wrinkles around my eyes. It makes my skin looks saggy and dry. I have very oily skin. Bags under my eyes, definitely. My biggest concern is age spots that I am getting. My biggest skin issue is dry skin. I have sensitive, dry skin. I also have eczema and vitiligo so I have to use a lot of sunblock. My biggest skin issues are acne/scarring and dry skin. My face gets dry, itchy and red. My wife would love to have the cool L’Oreal Revitalift Cicacreamv to use for fine lines and wrinkles daily. A fascinating L’Oreal Revitalift Cicacream, my wife would enjoy using all of the time for fine lines and wrinkles, and it would be an amazing gift. My lady friend likes good thngs, and the L’Oreal Revitalift Cicacream would be just marvelous to use for fine lines and wrinkles and great for all occasions. A captivating L’Oreal Revitalift Cicacream would be a fabulous gift for my girlfriend, and it would be nice to use for fine lines and wrinkles. The awesome L’Oreal Revitalift Cicacream would be just right to use for fine lines and wrinkles everyday and my wife to have.